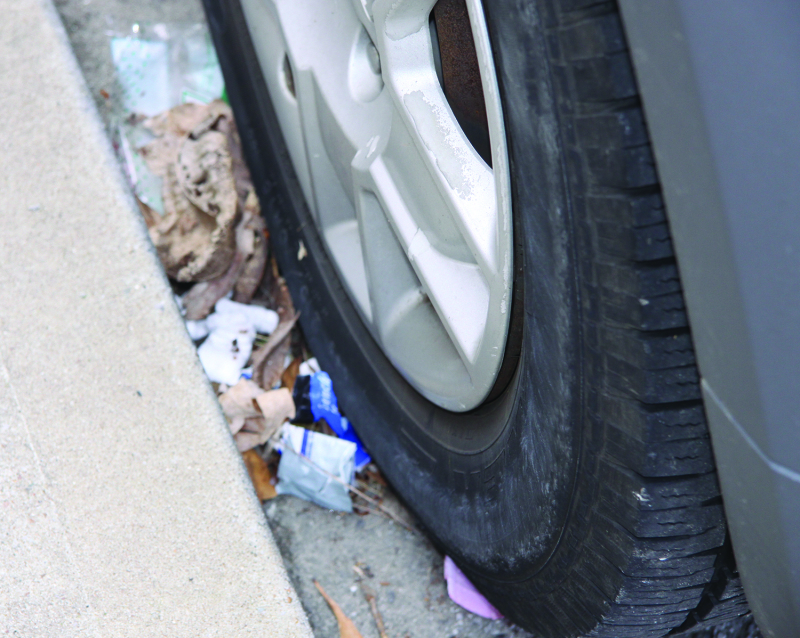 Litter tossed out from vehicles piles up along Main Street in Woodbury. Spring is almost here and the hills and hollows of Cannon County will soon burst into color. Visitors from across Tennessee and the nation will soon be arriving to enjoy the beauty. The question is whether or not litter will be blighting that perfect picture. "We live in the prettiest part of the world," said County Executive Mike Gannon, "and its a shame some people litter it up." The litter problem isn't as bad as it once was. People would dump tires, trash and even old refrigerators and appliances. "Parchcorn was particularly a bad area with people dumping their trash into a deep chasm off the side of the road," he said. "We've come a long way, but we can still do better," Gannon continued. "I plead with my fellow Cannon Countians not to litter." Much of the problem is due to inadvertent litter with trash being blown out of cars and trucks and accumulating along the roadside. Other littering is purposeful with motorists tossing out wrappers and bottles instead of putting them in a litter bag and dumping them when appropriate. "Really, there is no excuse for littering," he said. Statistically, young males, from ages 18-25, are the worst offenders. Why? They are always in a hurry and they want their cars to be clean inside and out. Cannon Countians need to use their available options, and in particular, the Cannon County Convenience Center. Located at 210 Alexander Drive in Woodbury, the center is open from 7 a.m. to 7 p.m. Monday, Tuesday, Thursday, Friday and Saturday. On Sundays, the center is open from noon to 7 p.m. It is closed on Wednesdays. "We're open 67 hours a week, longer than any other convenience center in Middle Tennessee," Gannon said. Those long hours keep the work schedules of most Cannon Countians in mind. "So many people work outside of the county," he explained. "We try to accommodate their working schedules by being open on weekends and later in the evening." Meanwhile, the convenience center is working to be more of a recycling center than ever before. "For a small county, we do a good bit of recycling of scrap metal, tires, cardboard, paper, aluminum cans and plastic containers. We hope to add glass to the list soon," Gannon said. Last year, Cannon County received $23,741 for recycling. "That's a penny on the tax rate and I'm proud of that," he said. "We will send out a crew to clean up the problem and we will attempt to prosecute the offenders," Gannon said.